Our vacation house is set amid delightful gardens in a secluded part of this out-of-the-way island. The West Indies-style house features a new kitchen, a large screened porch facing the sea, a patio with views of the volcano and other hills, and a swimming pool. There are two bedrooms, a sleeping porch, and three baths -- plus a sofa bed in the living room. The two bedrooms have air-conditioning for warm summer nights. Local artwork complements the home's lovely color scheme. Sitting at the convenient, built-in computer desk with WiFi access for your laptop and other devices, you'll enjoy an expansive view of the sea. The high, vaulted ceilings, traditional wooden awnings, and ceiling fans maximize the cooling Atlantic breezes coming over the mountains behind you. A beautiful wooden staircase takes you through gardens and down to a secluded beach with soft black sand. Amenities include Internet access, a washer/dryer, and a grill on the patio. The beautiful and innovatively designed gardens were developed by Julie Toll, who has won many awards in England, including 4 Gold and 2 Silver awards at the famous Chelsea Flower Show. Her special interest is the use of native species, and environmentally-sound landscaping. Secluded on our private acreage, you'll hear only the sounds of nature: the wind in the banana trees, the birds, the crickets, and the waves on the shore of the virtually private beach. (While all beaches are public property on Nevis, the only way to get to this beach is down our stairway.) The 360-degree views provide fabulous sunrises and sunsets, and the passing spectacle of the changing clouds all day long. This is a great place to get away from it all, and write, paint, play music, or just relax. On the sides of Mt. Nevis, the now-quiet volcano, are tropical forests with near-rainforest vegetation. Our comprehensive guest information books give recommendations for our favorite restaurants and activities, with details about where to go and how to get there. With temperatures in the 80's year-round, guest sometimes tell us they regret having to ever leave! Nevis is a small island, popular with those who seek a comparatively undeveloped tropical island to enjoy nature, hiking, swimming, and the wonderful views. Hiking in the rainforest is a popular activity. Knowledgeable guides are available to take adventurous hikers to the top of the volcano. Horseback riding and biking are available, and deep sea-fishing, sailing, scuba, and windsurfing are popular activities. There are art galleries and 2 museums. Information about activities and restaurants is waiting for you in our guest information binder. One of our guests, who grew up on a different nearby island, declared our garden the most beautiful in the Caribbean. We just use simple plants, largely native species, local plants that thrive in the dry, sunny, seaside location. Native hardwoods like logwood, sandbox tree, and wild almond, and majestic royal palms: these are main features. The main reason for the engaging and delightful appeal is the inspired talent of Julie Toll, a well-known landscape designer based in Britain. And the setting itself is charming: sea in front, mountain behind. There's plenty to do on Nevis, but some of our guests tell us that once they get here, they don't feel motivated to leave very much for other places. They'd rather just hang around and enjoy Black Sand Cove. The house has 2 bathtubs, and 3 showers, plus an outdoor shower stall off the patio. I always like to use the patio shower, with the great views of gardens and the mountain. There's also an outdoor shower by the pool, for rinsing sand from the beach, before you jump in. The black sand beach is good for swimming, wading, and enjoying the sunsets. Black Sand Cove in is a secluded area of Nevis, about 2 miles from the town. It's peaceful, listening to the waves, wind, crickets, frogs. Our house is 100 yards from the stairway to the Caribbean. The beach at the foot of our property is great for swimming. Mt Nevis, the dominant feature of the profile of the island, is behind our place, and Saddle Hill off to the east. A wide view of the Caribbean stretches out in front of the porch, nearly 180 degrees. We have air-conditioning in the two bedrooms in the house. The sleeping porch has the best breeze, so it is naturally cooler. The house is open to the sea, West Indies style. Our internet connection is the fastest we can get here on the island. This is a 3rd-world country, in terms of infrastructure. There's some variation in speed. Be patient. The house has WiFi, as does the cottage. There's a lovely living room, though the large screened-in porch is used the most. We usually eat all meals on the screened porch in front. If the evening is very warm, it can be cooler to eat at the table on the back patio, where there is the most breeze. Indoor table also. You're sure to find something you'll want to read, as there are several shelves of books. We have a collection of games for adults and children. Please smoke on the patio or porch. The pool goes with the house, and is not used by the guests in the cottage. The units are designed to be entirely separate. There is a hot tub for the guests of the cottage only. The spacious house has a convenient desk, and if you travel with a laptop, you'll enjoy working with a ocean breeze and views of the gardens and the sea. And the house has several pleasant dining areas, depending on the weather: on the screened porch, on the garden patio, or indoors. Elderly or handicapped guests may wish to know that there is a step up to the door, and another step up to the living room. Beautiful landscaping on a large property located on the water. We used the pool daily and explored many of the beaches and plantation inns on Nevis. Overall, a great experience. We found it particularly valuable that there was a local caretaker and groundskeeper who could assist us with questions and suggestions to make our stay on Nevis as convenient and stress free as possible. We've had our caretaker, Adolfo, for 18 years, so he's had lots of experience helping our guests with all kinds of issues. Our groundskeeper, Nelson, has worked with us 16 years; he may leave on the patio for you a coconut or papaya, carambola, or loquats if they are in season. We enjoyed our stay at Black Sand Cove. Quiet, comfortable and beautiful surroundings. There were lots of things to do on the island. Serenity in a Tropical Oasis...Amazing Property and Owner. Wow, wow, wow...just arrived home...(boohoo) from the most glorious & wonderful vacation. I was lucky to have come across this home while researching for our trip to Nevis. Knowing we didn’t want to stay in a large resort, as soon as I saw it I knew I had found our vacation for the week. Set in “Stunning grounds” with the most breathtaking view of the ocean, this tropical paradise is sublime, tranquil and rejuvenating. Black Sand Cove sparkles not just when your feet are standing in the Black glittering sand, all around everything from the home to the pool and the OUTDOOR shower....I loved this looking at the gardens and Nevis from the back of the house, bees, hummingbirds & butterflies flitting by. The house is equipped with everything you could possibly need, from beach towels to a blender. Chairs for the beach and even a cooler. We started our day with a hike right from the back door & greeted along the way by the goats and donkeys. Then a dip in the most wonderful pool with breathtaking views. Head out for a bite to eat...but just know an hour away from BSC & you will be wanting to get back to the serenity. Linda the owner has everything set up so well & runs so smoothly. Adolfo is a gem & knowing that he is around takes you to another level of feeling relaxed he is a fountain of information & so kind & welcoming. Nelson will spoil you with goodies from the garden, fresh mangoes & coconuts I made a drink with them all & called it “Nelson”! Black Sand Cove in my opinion is way more than 5 stars. Each day something else would make me love this place even more. We all feel so lucky to have had such a truly wonderful vacation in a very special place on earth! If you Love nature, peace & quiet,being away from it all then this is the place for you. Believe me you won’t be disappointed. Adolfo Will organise Pickup from the airport to dock for arrival & return. Tips: Adolfo kindly picked up provisions so our first morning was set & ready to go. We shopped at the IGA & Rams. We hired a car from Linda as well, which meant no worries about going to pick up rental. Eats: Fav Golden Rock, Gin Trap, Turtle Time, Bombay Bites ( great view of St. Kitts and amazing food) Chisley Beach. I wish I could share pics here, check out BSC FB page. If it's available, book it. Our family has rented dozens of properties, this one is hands down the best we've stayed in. 1. Communication/staff - outstanding. Picked up from airport, all arrangements made, rental 4x4 waiting for you. Adolfo is an amazing caretaker who can be reached by cell at anytime to address any needs that arise. 2. Property - dream location. Several acres of professionally landscape "magic gardens" as our daughter called it overlooking the Caribbean with your own pool. The house itself was spacious and charming. Why stay in a cramped place in the Four Seasons for twice as much with a bunch of annoying tourists when you can have a whole private estate to yourself! 3. Easy access to amenities - even though this place is the last house on a dirt road, there are two well stocked grocery stores within 5-7 minute drive and lots of great restaurants on the island which is super small and easy to get around. 4. Super kid friendly - tons of gear and games for kids. The pool is perfect for kids. They loved seeing all the birds and running around the gardens, and collecting shells on the beach. We hope to make it back as many others have. Having just ended our 5th stay on the island of Nevis and at this amazing property we continue to expand our length of stay, but it will never be long enough. The property is secluded from the slightly less laid back other side of the island and this is what makes Black Sands special and perfect for us. The main home is modern and well supplied with all the necessities that are required to entertain and cook. Both bedrooms have separate bathrooms and AC units for those in need of these mainland amenities. There is also an outside bathroom and an additional outside shower which overlooks the small picturesque extinct volcano about 5 miles from the property. The property manager Adolfo and the rest of the staff have always extended a warm welcome and made sure each stay was memorable. We enjoy spend the mornings at the home, taking in the black sands cove beach, cooling down in the pool and walking around the well maintained gardens. The vehicle is needed if you would like to explore the further reaches of the islands 36-mile circumference. Afternoons are spent on one of the many amazing beaches of Nevis, but watch out for the non-existent crowds as you may be the only ones on the beach. The availability in the choices of restaurants for Lunch and Dinner dinning are many and one needs to make sure and try a variety from the very local Mems Pizza and sit under the very large mango trees to our personal favorites like Banana’s for sunset and Golden Rock which has a great vista of the easterly views from the island along with some great trails. All said we enjoy each stay at Black Sands, relax and refresh ourselves from the winters challenges of the North East and hope to come back another year. My wife and family visited Black Sand Cove for the first time in 2004. This time, it was just the two of us, celebrating our 30th anniversary. We chose Black Sand Cove again, because we couldn't think of a place we would rather be together for two weeks. It was a good decision. It is even more beautiful here than it was 10 years ago. We like the fact that the road goes around the property now, rather than in front of the house. The landscaping is great! The mature trees now give the place more shade. We went on several hikes that we didn't get to complete the last time we were here and ate at a few really good restaurants. We love the ocean view from the pool. Black Sand Cove is a great place to read a few books and with internet access now, to watch a few good movies. We even watched a season of episodes of a show we had been wanting to see. It was a completely relaxing and enjoyable vacation. Nevis is a small island, comparatively undeveloped, and off-the-beaten-track. Nature, hiking, swimming, birding, enjoying the rainforest and the fabulous views, and just relaxing: these are popular activities. Nevis has lots of nice restaurants, but if you're looking for casinos, nightlife, and shopping, you need a different island. 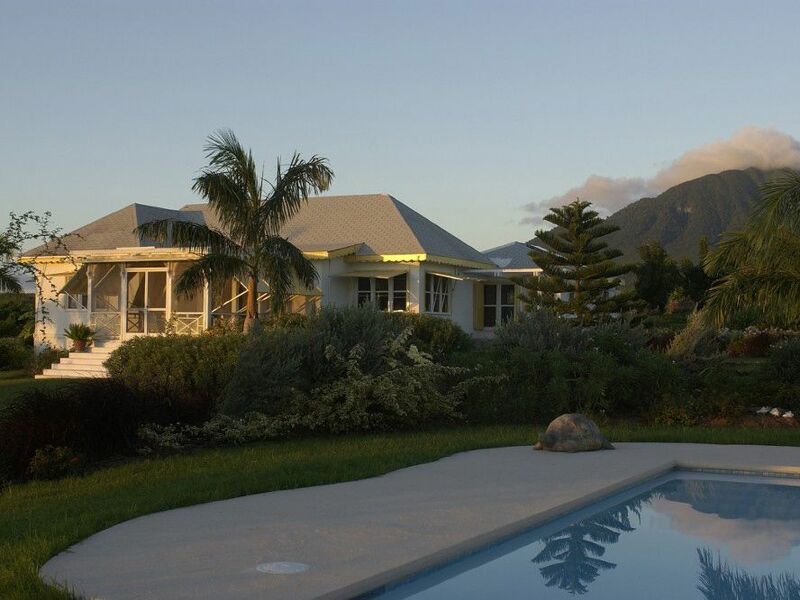 For a delightful natural environment, on a comparatively undeveloped island, we recommend Nevis! Add $100 per week for each person over 4, to cover for extra cleaning time during and after your visit. The maid comes twice per week.